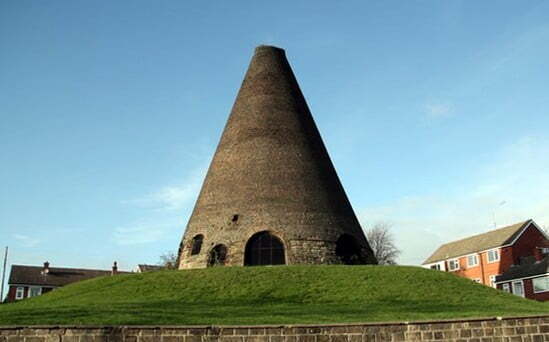 Catcliffe Glass Cone is the oldest surviving structure of its type in Western Europe! It is also a Grade I listed building and Scheduled Ancient Monument. This glorious glass cone was part of the Catcliffe glassworks. They were established in 1740 by William Fenney, who had previously been the manager of the glassworks at Bolsterstone. That Glassworks was owned by his mother-in-law and for some reason, the terms of her will prevented him from setting up a glassworks within 10 miles (16 km) of the works at Bolsterstone. So, the site at Catcliffe is 10.5 miles away! The glassworks closed c.1887, but was reopened briefly in 1900, then in WWI the site was used as a prisoner-of-war camp. The cone was threatened with demolition in the 1960s so the foundations of the other buildings that comprised the glassworks were excavated in 1962, but thankfully, in 1968 the cone received Grade I listing. There are only 3 other glass cones in the UK – at Lemington, Wordsley and Alloa.